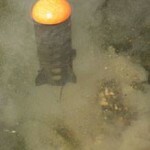 If you want to chum at mid to long range, a spod or a spomb is the answer for most situations. A spod dropping its payload out the back as the nose floats to the surface. A spod is a device that look like a rocket. You tie it to the end of your main line. You fill the spod with chum and cast it to your fishing spot. When the spod hits the water the buoyant nose floats to the surface and the chum falls out the back into the water. When filling a spod, pack the chum loosely into the back of the spod and leave it about 3/4 full. 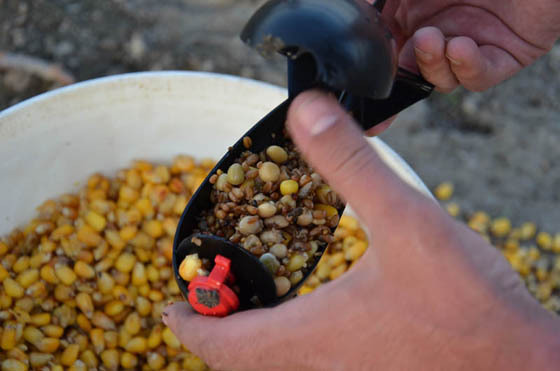 If you fill a spod to the brim it will spill lots of chum out the back during the cast. Spods come in all sorts of sizes and designs. Some factors to consider when choosing a spod is the payload. The more chum a spod carries the more it weighs. The more it weighs the stiffer your rod must be to cast it. Match the size of the spod to the optimal lure weight of your rod so that you can get the maximum distance and performance from your rod. payload also means that if your cast lands wide of your hook you aren’t putting a huge pile of attractant in the water to draw fish away from your hook. A smaller payload increases the chances of the fish finding your hook if your hook is not exactly on top the chum. The barrels of spods usually have holes. The holes allow water to enter in to the spod and wash out the contents. The stickier the chum the more holes you need. The soupier the chum the more the chum will fall out of the holes during casting. Some duct tape can be used to cover up the holes when using soupy chum. Boilie spods need no holes. Soupy particle baits and zig rig chum need few if any. 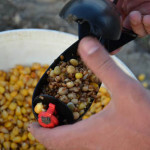 Sticky mixes with flour or oatmeal need a lot of holes and deer corn and chick peas need lots of holes as well. A spomb open and being filled. 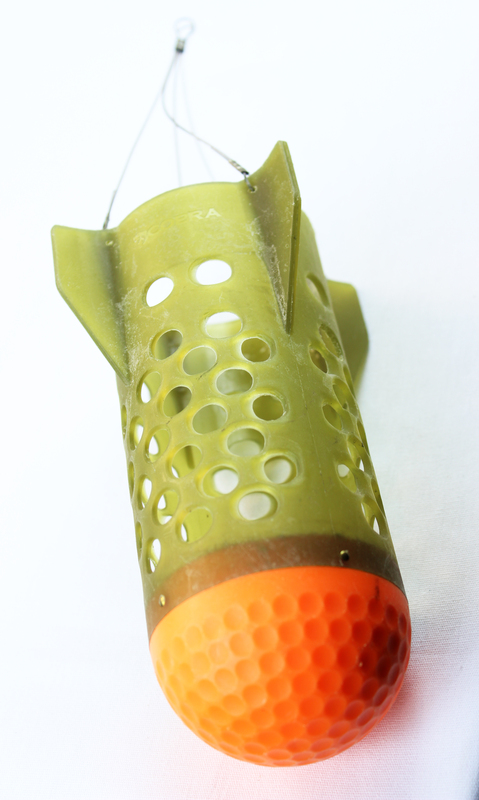 A spomb close and ready for casting. 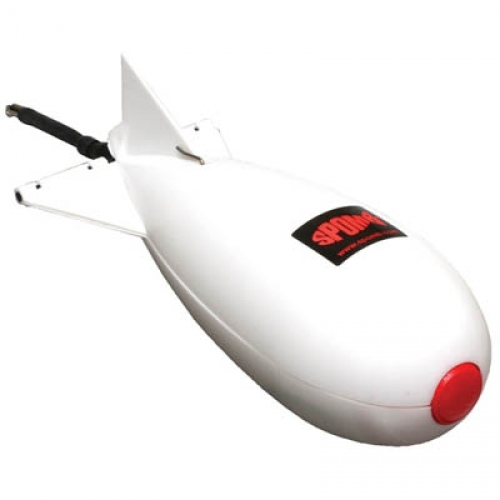 Spombs are basically spods that are shaped like a bomb. The spomb has a button on its nose. 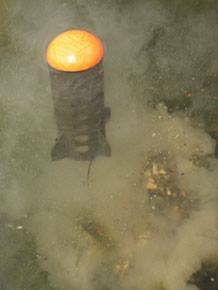 When the spomb impacts the water the button is pushed by the impact and the spomb bursts open length-wise. This difference in design creates a couple advantages. First, the spod can handle extremely soupy mixes or stiff mixes without much difference in performance. eaves a trail of trail between you and the fishing spot. This trail can draw fishing away from your fishing spot. The down side to a spomb is moving parts. The release and clasp mechanism can break and wear out over time and then your fishing is over for the day. However, if you aren’t rough with your spomb it should last a long time. 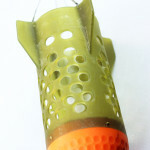 Here is a quick video of how a spomb opens and closes.